Artistic Director and starring performer, Daniel Sugimoto has written likely his most intimate world premiere ever for Zoo Theatre Company in My Date With Death – A Musical Romance, a two-person, biopic treatise on the ultimate purpose of a person’s life. Billed as a sci-fi inspired, Dickensian sprint across the Universe, Sugimoto has agglomerated a heap of emotionally charged and highly complicated material and attempted to explore the darkest sides of depression, suicide, scars of familial relationships, standard ideas of religion, and the meaning of life, death and genuine love at its most prescient core. In My Date With Death, Link finds himself at the end of his rope, drinking the remainder of his life away at a bar when he is visited by a Spirit from Beyond, Lady Death. The Spirit reveals herself to be a Soul Collector sent to keep Link from ending his life energy too soon. In a state of suspended time, the two debate the work of a soul and what a soul actually is, almost coming to no conclusions that Link can believe in, until he convinces Death to make a promise that could change the construct of the Universe itself. Not without its taxing verbosity, repetitive song list (12 original) and directing and delivery flaws, My Date With Death is actually beautifully scored, giving Sugimoto the opportunity to open up for view, the honest to goodness, most painful, destructive and redeeming moments of his life. It’s actually both frightening and admiral to see a performer take this kind of risk on stage, putting out some subjectively disturbing material for public view. But he does so with captivating determination if not always nuance or conclusion. Samantha M. Lawrence as Lady Death is perfectly cast as the foil to Link’s plan and reads every bit the frustrated spirit with her own secret as much as embodying an ultimately merciful and kind angel of the matrix trying to escape her own current job status. The show needs some work – cutting down and more vocal projection by both performers as well as a bit more simplification and occasionally more definition of the many ideas for audience consumption. 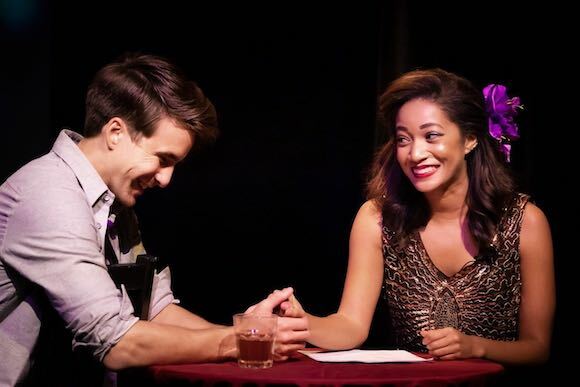 Altogether though, My Date With Death, playing at the Miles Memorial Playhouse, Santa Monica, is a highly moving and intimate experience.